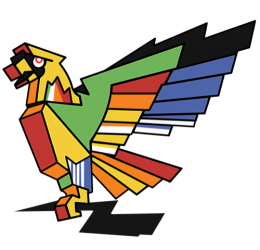 The Las Vegas Radio Amateur Club, Inc. (LVRAC), the oldest amateur radio club in Las Vegas, has been active in the Clark County community since April 1961 and is an ARRL (The National Association of Amateur Radio) Affiliated Club. Radio amateurs, often called “hams,” enjoy radio technology as a hobby. Ham radio operators are men and women of all ages and walks of life who are linked by their interest in wireless communications technologies. Hams are all licensed by the Federal Communication Commission (FCC), and provide a significant amount of public service to the community. The club supports public service organizations such as Red Rock Search and Rescue and assists local government agencies in time of need when regular communication systems fail or are overloaded. Many of the LVRAC members also belong to the Radio Amateur Emergency Service (ARES) which is a volunteer emergency communications organization supporting local, state and federal government agencies. LVRAC provides volunteers to assist in wireless communications for local area events like the Silver State Classic Road race and the annual Baker to Las Vegas foot race supporting Nevada and California police agencies. Members of the club also volunteer to assist charitable organizations with their fund raising events; including the Susan G. Komen Cancer Organization where our hams provide the communications to coordinate their annual Las Vegas race; the National Nurses Association’s annual half marathon; the American Diabetes Association bicycle race, and many other local non-profit organizations. LVRAC promotes interest in Amateur Radio through general education in communications technologies to schools and youth groups such as the Boy Scouts. LVRAC also provides and maintains a radio communication network consisting of VHF and UHF repeaters that cover the Las Vegas valley and Clark County. This repeater system (call sign K7UGE) has a VHF repeater located atop the Westgate Casino and Hotel operating on a frequency of 146.940 Mhz. using a PL tone of 100.0 Hz. and linked to a UHF repeater located at Southern Hills Hospital operating on a frequency of 448.500 Mhz. using a PL tone of 100.0 Hz. Please feel free to join us if you are a licensed Ham or just listen in if not yet a Ham, on the Weekly LVRAC Net that is held every Tuesday evening at 7:00PM local time on the K7UGE repeater system. If you are a new Ham or just want to understand a little more about this great hobby, LVRAC holds regular meetings on the third Wednesday of every month, starting at 6:00 PM for a “Social Hour” with the general meeting being called to order at 7:00 PM local time, located at the Red Rock Search and Rescue building, 340 Villa Monterey Dr., Las Vegas, Nevada. All are welcome and we encourage you to become a member of the Las Vegas Radio Amateur Club. LVRAC is a nonprofit corporation registered in the State of Nevada and recognized under the IRS code 501(c) (3). Donations to the Club are tax deductible and always welcome. The LVRAC was formed in April of 1961, and is the oldest HAM radio club in Las Vegas. It began in Jerry Mann’s kitchen (W7VYC later N7CAH now SK). The first meeting was held as a picnic at Mt. Charleston, 150 people attended. 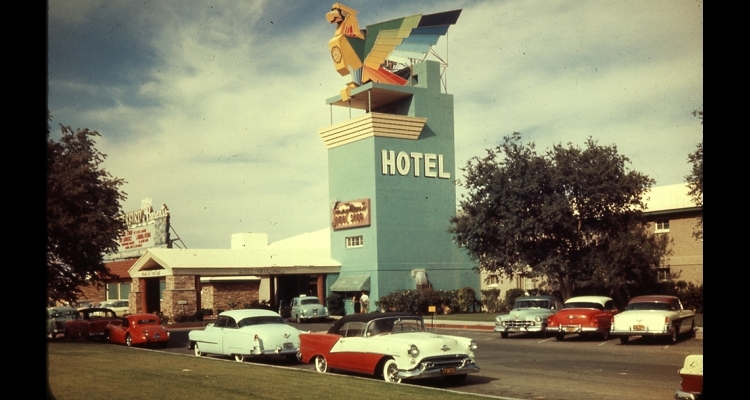 In the early days of the LVRAC the club was contacted by Joe Wells, then the head of the Thunderbird Hotel, who wanted to establish a ham station in the hotel. He offered to purchase the equipment and provide a room in which to build a station. He bought a full Collins Radio S-line system (the finest equipment made at the time), Hy-Gain beam antennas and all the necessary accessories to equip a fully functional station. A glass windowed room, completely visible, to the hotel’s patrons, was built to house the station. All LVRAC members had station access key cards and could operate the station at any time. Club meetings were held at the hotel. 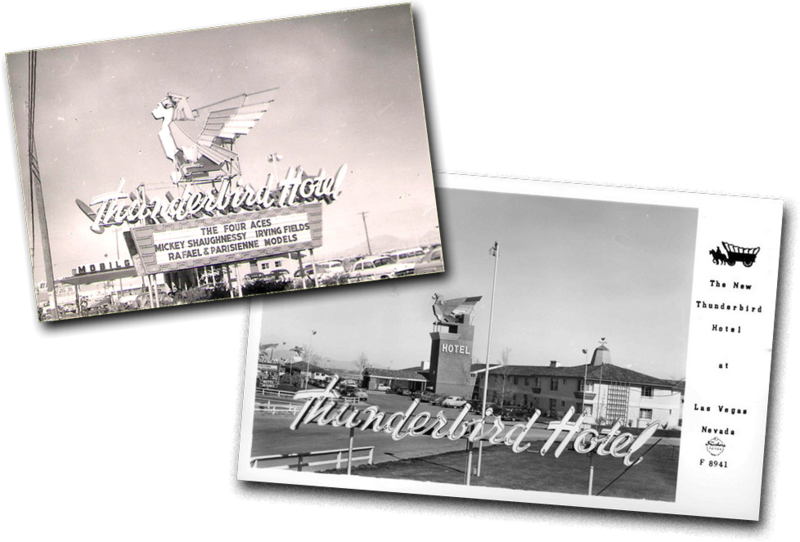 The colorful “Thunderbird ” is our current logo as a symbol of the club’s early affiliation with the Thunderbird Hotel more than a half of a century ago.